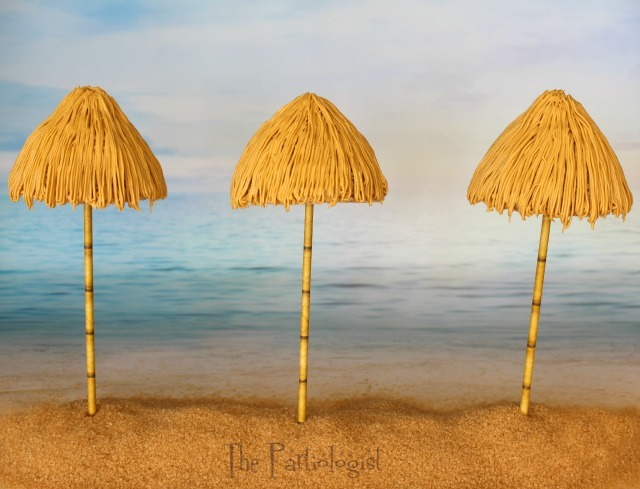 The Partiologist: Edible Beach Umbrellas! I have been spending my days surrounded by sun and sand with gorgeous views... and by that I mean making tropical stuff. Don't you love when you find the perfect spot on the beach? Along with a cute cabana boy to bring your umbrella? It's been a long time since I've had the opportunity to sit on the beach under an umbrella. Today, in a matter of minutes, I'll take you there. Do I need to bribe you any more? I can't wait to spend all my weekends at the beach. Start by making Rice Krispie Treats - Recipe HERE. Spray the inside of a funnel with pam. Press rice krispie mixture 3/4 into the funnel. Turn over and release the krispie treat onto parchment paper. 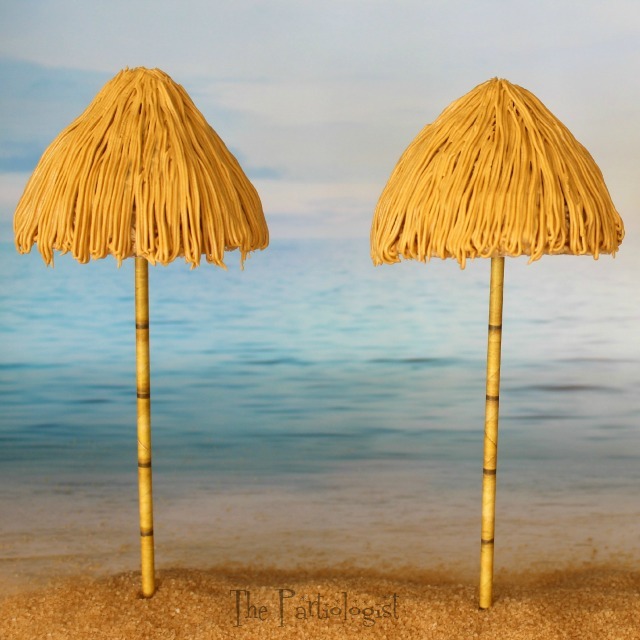 Along with my order for hula girl picks from Oriental Trading, I also found bamboo straws - perfect for this project. Gather up a few doilies. 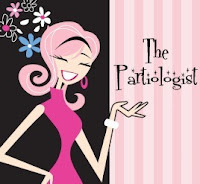 Turn the RKT umbrella over and place a doily on the bottom. Poke a hole through the doily into the RKT and insert lollipop stick. Remove stick and pip in a dollop of royal icing. Reinsert stick and let dry overnight. Cover stick with a bamboo straw. Insert RKT into something sturdy, styrofoam works well. Get ready to pipe frosting around the RKT. For this, I started with white and added, tiny drops at a time of brown, pink, ivory and gold. Don't have a clue how many of each drop, just kept mixing until I got the color. Using a Wilton #233 begin piping grass around the RKT. Start by piping one full strip from bottom to top, then the next strip, only go half way up. Cover the half strip with another full strip and alternate until the RKT is covered. Sounds like a great idea - thank you Cheryl! How do you continue to come up with all of these cute ideas...not to mention that some of these ideas I can actually do myself! I probably won't because they wouldn't be as cute as yours! I love the little umbrellas! I think you should box them with the card and I could order them to send as an edible postcard! Who wouldn't want to get that in the mail!!! Your summer treats are so much fun that they do take me back to my days at the beach. I'd love to be hanging out under one of these umbrellas right now! Thank you Beth - Wouldn't that be a great way to start the weekend? 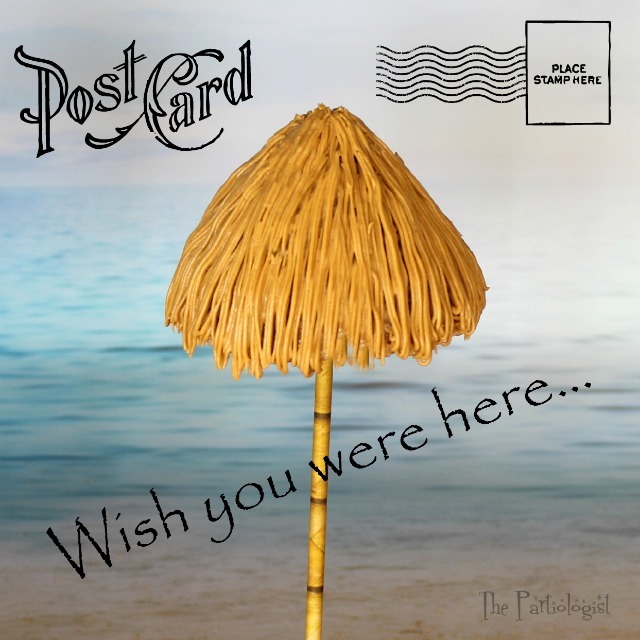 If I could, I would send everyone an edible umbrella postcard! I love all these hula party treats. Wow those straws are so versatile with your amazing brain to come up with all these different ways to use them. Oh my gosh, these are just adorable! and I love the last photo where you made it into a post card. Too much fun! Makes me want to head to the beach right now. Thank you Tiffany, you're right, I really want to head to the beach!!! NOW! Love the way you've worked with the bamboo straws! Darling ideas!